Salerno sitting to the extreme end of the Amalfi Coast was first an Etruscan settlement and then taken by the Romans. After the Normans took it in the 1000s Salerno became a thriving town and the capital of the dukedom of Robert Guiscard. He favoured the growth of the Scuola Medica Salernitana and it became one of the most respected medical institutions in the Middle Ages. In the last century the WWII caused extensive damage. Medieval religious buildings, typical trattorias, trendy bars and tattoo parlours carpet its historic centre. The Cathedral of Salerno is in the heart of its historic centre. Robert Gusicard had it built in the 1000s. It underwent modifications in the 18th century and was badly damaged in an earthquake in the last part of the 20th century. 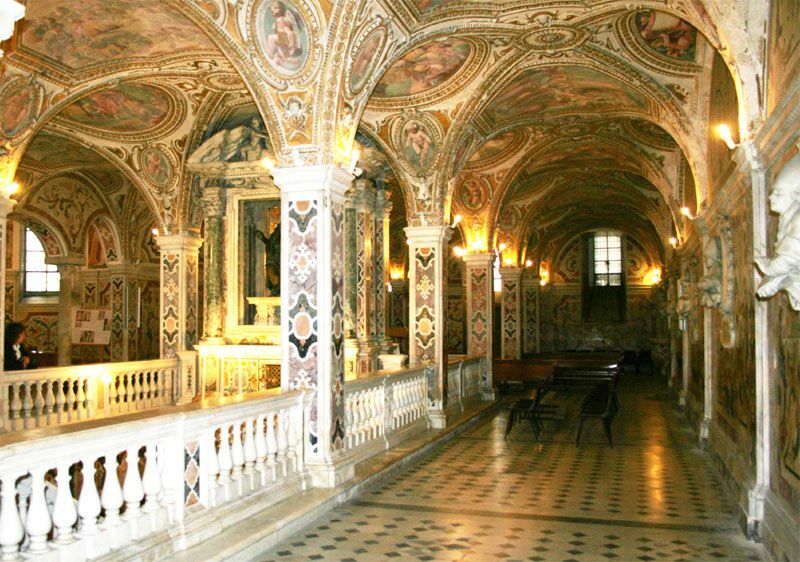 The crypt underneath the main altar is where San Matteo has lain since his body was moved to Salerno in the mid 10th century. Porta dei Leoni has two marble lions escorting the steps bottom. It opens onto a atrium towered by a bell tower incorporated in the 12th century. Three enormous 11th century bronze doors from Constantinople lead to the interior. The cathedral is mostly baroque. Only the transept, the choir flooring and both pulpits in front of the choir have remained of the church erected originally. In its Chapel of the Crusades crusaders arms were blessed. Gregory VII remains are underneath its altar. The Museo Diocesano on Largo del Plesbiscito houses some Norman and Lombard pieces of art. The ivory paliotto dating back to the 12th century depicts Bible’s passages. Off the Museo Diocesano is the Museo Archeologico Provinciale on Via San Benedetto. It is the most important in the province. Check out the bronze head of Apollo of the 1st century BC found in the bay. Museo Pinacoteca Provinciale on Via Mercanti sits in the quarter of the Middle Ages. 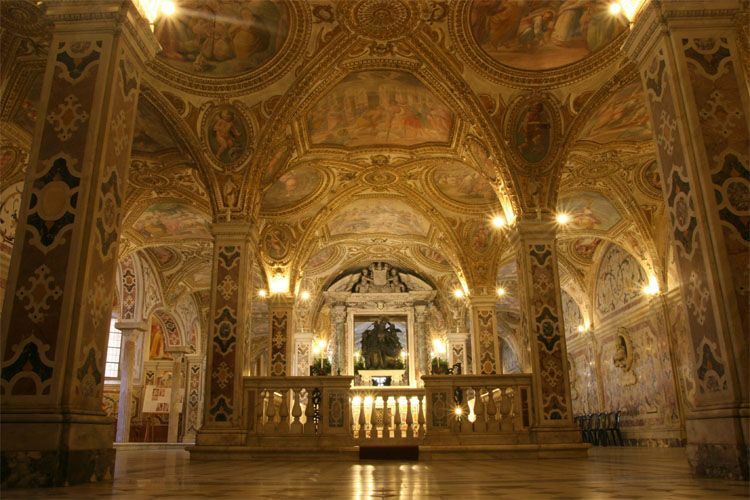 Its collection exhibits pieces from the Renaissance to the 1850s among which are some Andrea Sabatini’s canvases and foreign painters staying in Salerno. The Museo Didattico della Scuola Medica Salernitana on Via Mercanti is housed in what was the church of San Gregorio. It displays information and pictures narrating the development of this medical institution inaugurated in the 9th century and shut down in the 1800s. The Castello di Arechi, a renowned symbol of Salerno, soars over the town from its high position. It was at first a Byzantine fort constructed by Arechi II the duke of Lombardy in the 700s. The Normans and Aragonese made changes. It displays weapons and ceramics and plays host to concerts in the summer. Bus 19 departing from Piazza XXIV Maggio runs to it. The tourist information office is on Piazza Vittorio Veneto where the railway station also is. Most trattorias, ice cream parlours and bars are located in the medieval quarters and Via Roma. Pinocchio on Lungomare Trieste is recommended by everyone because of its good food and well priced dishes of seafood and different kinds of meat dishes. In the summer you can dine on the pavement while in the winter the dining hall sporting Pinocchio’s pictures will fill with customers. Pizza Margherita on Corso Garibaldi is a well liked place serving generous portions of pasta, pizza and other main courses. Ristorante Santa Lucia on Via Roma is set on this hip thoroughfare and dishes out seafood and some very well prepared dishes and great pizza made in a wooden oven. The restaurant infuses its customers with friendliness and relaxation. Vicolo della Neve is on the street of the same name. It is the typical trattoria in the historic centre so popular that you will certainly have to queue to find a place. Décor includes walls covered with fake frescoes with brick arches and pieces created by local artists. Its menu lists all the traditional cuisine. BY BUS: to Amalfi (length: 1 ¼ hours, services: every hour) calling at Vietri sul Mare, Cetara, Maiori and Minori. They depart by the railway station and its ticket office is on the square. To Naples (services: every 25 minutes) departing from bar Cioffi where tickets are purchased (Corso Garibaldi). To Pompeii by bus 50 leaving from Piazza Vittorio Venetto (length: 1 hour, services: 15 a day). To the south coast and Paestum by bus 34 from Piazza della Concordia (length: 1.20 hours, services: 12 a day). To Naples Capodichino Airport leaving from the railway station ( length: 1 hour, services: 4 a day). 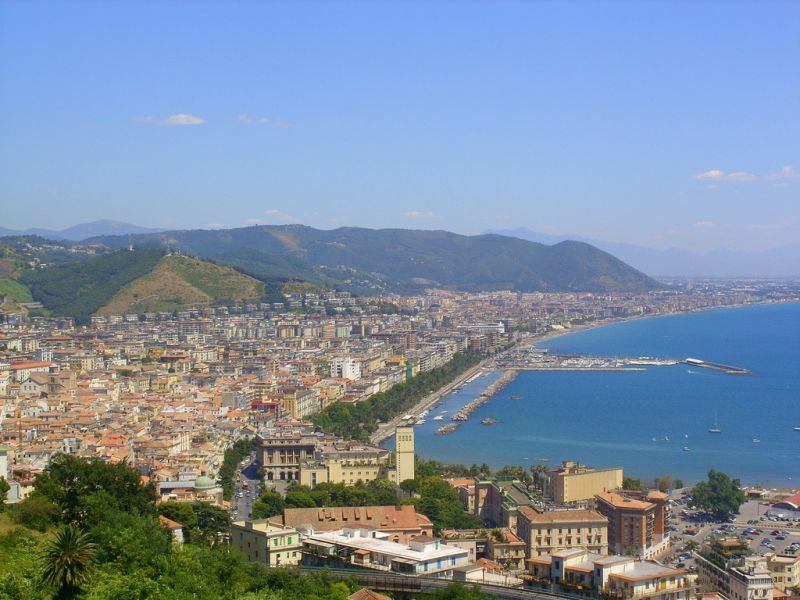 BY CAR: Salerno is on the A3 connecting Naples and Reggio di Calabria. Off the railway station there is a car rental agency on Via G Vicinanza. BY HIDROFOIL OR FERRY: to Positano (services:7 a day, from April to October). To Amalfi (services: 7 a day). Boats leave from Porto Turistico of Piazza della Concordia. Ticket booths are where passengers go on their boats. By Metro del Mare leaving from Molo Manfredi at the Porto Commerciale to Positano (services: 3 a day), to Amalfi (services: 2 a day), to Sorrento (services: 3 a day). To Capri by LMP (services: 5 a day). BY TRAIN: Salerno is an important stop on the roads connecting Calabria, the Ionian and Adriatic towns. To Naples (length: 50 minutes, services: every half an hour), to Rome (length:2 ½ hours, services: every hour), to Reggio di Calabria (length: 4 ½ hours, services: 15 a day).